We manufacture and export of Unlaminated PP/HDPE Woven Fabric, which are used for wrapping of steel coils, tyres, yarn cones and other industrial products. These unlaminated PP woven fabric and unlaminated HDPE woven fabric are suitable for multiple packaging. Different sizes of these fabrics can be availed from us and as per client's specifications. These unlaminated PP woven fabrics and unlaminated HDPE woven fabrics are manufactured using quality fabrics, which make them durable, strong, safe to use etc. 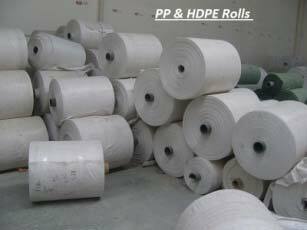 These Unlaminated PP/HDPE Woven Fabric find application in wrapping paper rolls, steel coils tyres etc. These highly functional fabrics can be availed at competitive prices.